Athlete’s foot is a type of fungal infection of the skin of the foot, affecting both the toes area and the soles of the feet. This type of fungal infection has been shown to easily spread to other parts of the body such as the hands or the area between the abdomen and the thighs, armpits, face or any other area where there is plenty of humidity to allow it to develop. The condition is caused several specific types of molds and is widespread among people of all ages and occupations. The infection is contracted by direct contact with either the skin of a person with athlete’s foot or a surface a person with athlete’s foot has walked on barefoot. Although very common and sometimes difficult to cure, athlete’s foot is only a fungal infection which can be successfully treated with proper hygiene and antifungal medication. What is athlete’s foot? Athlete’s foot is first of all an infectious skin disease. It is caused by several types of fungi called molds, hence the name skin fungal infection. The infection originally affected only athletes who trained in sweaty, hot and humid footwear and then walked barefoot in locations used by the rest of their colleagues such as training stations, lockers, showers, etc. Because of the rise in popularity of gyms equipped with communal showers, lockers or changerooms, public pool surfaces, motel bathtubs, etc. everyone walking barefoot or touching surfaces other people’s skin has touched may be at risk of contracting this type of skin fungal infection. 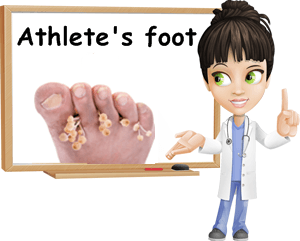 Other common names for athlete’s foot include tinea pedum, tinea pedis, foot ringworm or moccasin foot. The fungi causing athlete’s foot may be one of the following molds: Epidermophyton floccosum, Trichophyton rubrum, Trichophyton tonsurans and Trichophyton mentagrophytes. These fungi thrive in warm, moist, sweaty environments so wearing tight shoes, not changing sweaty socks, not washing daily if you have sweaty feet, etc. can make infections persist or reoccur. 1) Red and scaly or flacky skin. Athlete’s skin is characterized by various degrees of redness and scaly or flaking of skin. Rash symptoms tend to appear principally in between the toes, especially the 4th and 5th toes, and the scaly appearance may extend to the soles of the feet. If maintained moist, the area will have a soft, white appearance. 2) Strong itching sensation. Not only athlete’s foot, but most other infectious skin diseases may manifest itching causing a strong need to scratch the affected area. Putting shoes on may result in localized pain and a burning sensation. 3) Spread to nails. Infected nails put on an unpleasant appearance in the sense that they may become twisted, discolored and brittle. 4) Bad odour, blisters, yellow skin. Most feet fungi, athlete’s foot included, will result in feet smelling bad as a result of dead skin cells and the overall infection. More severe cases and those left untreated can engender painful blisters, skin fissures, crusts and an even stronger bad odour. 1) Communal space surfaces. Walking barefoot in public swimming pool adjacent areas, communal showers, gyms, locker rooms or gym showers, using bathtubs from hotels, going to nail salons etc. may increase the risk of contracting athlete’s foot. The fungi causing the skin infection thrive on wet, moist surfaces such as these. 2) Direct contant. Touching the skin of a person with athlete’s foot will probably result in you contracting the infection as well. Good hygiene such as changing sweaty clothes and socks, wearing clean underwear, slippers, flip flops, pool shoes, etc. is imperative for not contracting the infection. If a member of the family has athlete’s foot, make sure the entire family avoids contact with infected skin, surfaces or clothes. 3) Sharing clothes, socks, footwear, towels or any other personal object that comes into contact with the infected area may result in the spread of the fungus. Whether it’s a friend, family member or strange, a public space or your own home, keep to your personal hygiene. 4) Humidity and sweat. Athlete’s foot molds thrive in moist, humid places and objects, notably bathtubs, shoes, clothes or towels. In order to avoid developing an infection, make sure you wash whenever you feel sweaty, feet included, change socks, underwear and other clothes as often as necessary, use clean towels and disinfect surfaces properly. 5) Sweaty feet. People who suffer from profuse sweating of the feet (known as plantar hyperhidrosis) are more likely to develop a foot fungal infection as sweat creates an environment both bacteria and fungi can thrive in. 6) Closed in shoes and synthetic fabrics that do not let the skin breathe create a grat environment for fungi to develop. Wearing socks made from acrylic, nylon or polyester as well as tight, closed in shoes for long periods of time may increase the risk of developing feet fungal infections such as athlete’s foot. 1) Wear shoes at all times, especially in public places such as pools, lockers, etc. 2) Do not share clothes or other personal items (towels, shoes). 3) Wear natural fabrics (cotton, wool, linen) that let the skin breathe. 4) Wash as often as necessary, especially following workouts or physical work. 5) Avoid wearing sweaty clothes, sock or underwear. 6) Keep feet and shoes clean and dry. 7) Avoid direct contact with the skin or clothes of people with athlete’s foot. 8) Avoid scratching infected areas in order to prevent the spread of the infection. 9) Keep home surfaces clean by using chlorine bleach if you suspect a fungal possible infection. If you should contract athlete’s foot, it is important that you keep to rigorous hygiene habits to keep your infection from spreading. Nonetheless, if you notice it progressing, then you might require antifungal medication, either topical treatment or medication, depending on severity and spread. How long should you take your antifungal medication? As long as your doctor recommends. Generally, the use of topical medication is recommended up to 2, 4 or 6 weeks following the disappearance of your symptoms, to make sure the infection does not reoccur and even the deeper layers of the skin affected by the fungus have cleared up.